Tory Fair’s heap of cast objects whose foam, concrete, and rubber physicalities bear the memories of absent originals – a favorite mug, her work boots, a camera that once belonged to her grandmother, a well-used soccer ball, a woven basket from time living in the Southwest – is the sole structure occupying the main room of Proof Gallery in South Boston. Its dimensions and orientation are in direct response to the narrow space, and invite immediate investigation upon entering the room. What does one recognize? What sensations are stirred? What meaning resides in the dialectic Fair creates between this mass of material and the evocative realm of interpretation? Close exploration of this gritty mound also reveals forms cast from the natural environment, including the occasional blooms of lilies. But most numerous are crystalline shapes in a dramatic range of sizes and postures, and often sprouting from or slicing through the domestic memorabilia. It is a disorienting experience of the familiar, muted by blackened and ashen surfaces. Moments of dappled light subtly animate the entire expanse, providing an episode of the ephemeral amidst the emotional and physical weight of extreme accumulation. Even Fair’s approach to creating an element of light in Heap was decidedly sculptural and not engaged with new technology. Turning to her archive of slides of her earlier work (a poetic addition to Heap’s dialectic of memories of absent originals), Fair cut specifically shaped holes in the slide film and then inserted the repurposed slides into several old slide projectors mounted above the installation. In a room without any natural light, these spots of projected light, while accentuating details of certain objects, conceptually extend the spatial reach of Heap, linking it to surrounds beyond the gallery walls. Fair’s aesthetic of connectedness builds upon the phenomenological reading of sculpture proposed decades earlier by Rosalind Krauss as an identification of the self “in contact with the space of the world.”3 In 1991, after graduating from Harvard with a degree in sculpture and religion, Fair was awarded a Gardner Travelling Fellowship that supported a year of driving across the country and studying Native American mounds, sun daggers, and medicine wheels. The year also marked a significant life experience that would encourage a convergence of her interests in sculpture, agnosticism, architecture, and the landscape – Fair sought out James Turrell in Flagstaff and assisted on his Roden Crater Project for the next three years. 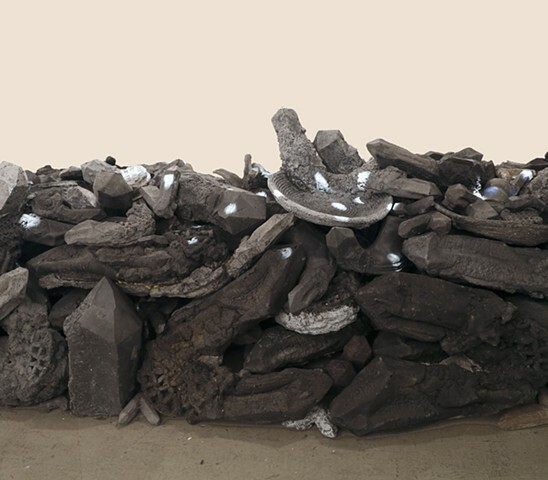 It is worth noting the kinship between Fair’s accumulation and the sculptural explorations of Robert Smithson (1938-1973), which often took the form of piles (amorphous and contained) of soil, minerals, or rocks in dialogue with a distant site. Smithson imagined sculpture as a form of temporal space capable of engaging “remote pasts and futures” as well as bridging the conceptual divide between the natural world and the built environment. During the past few years the crystal, a common yet exquisite form of natural order and repeating pattern that also preoccupied Smithson, has become central to Fair’s sculptural practice. Initially embellishing other objects and surfaces to signify a transformation of the mundane (such as Windshield, 2013), the crystal form (based on six-sided prisms each terminating in a six-sided pyramid) is now the dominant structural component to which other objects in Heap have adapted. Rather than a proliferation of perfection, the mash-up of crystals populating Heap is subject to Fair’s willful experimentation and imagination. Although all were cast from a small quartz specimen, they reappear as opaque solids in an unpredictable array of sizes, positions, and textures (from finger- to arm-length, from erect to collapsed, from smooth rubber to encrusted concrete), while generating as many allusions (from the architectural to the anthropomorphic, including most obviously, the phallic). Perhaps as a foil to Heap’s apparent precariousness, Fair constructed passages of geometry (albeit often battered and bruised) creating an inherent logic between abutting forms: repeating circular shapes (pillow, soccer ball, frozen waffle, and basket); a waffle’s imperfect but legible grid; the pyramidal tips of crystals; the soccer ball’s pentagon-and-hexagon pattern. Fair’s subjectivized embrace of repetition and the paradoxical freedoms it allows also becomes an eloquent metaphor for finding meaning and moments of clarity in the daily routines of our lives, lives populated by objects like those she chose to cast. That Fair has been committed to casting multiples in the service of reclaiming an object’s individuality reveals something about her character – an uncommon combination of fortitude and humility. Maturing artistically amidst a prevalence of contemporary sculptures and immersive installations which repurpose found objects and materials – from the innovations of Judy Pfaff to the work of Sarah Sze – Fair has dedicated her studio practice to the translation of objects into other objects. Fair’s work has affinities with Amanda Ross-Ho’s oversize jewelry and jersey constructions and Alice Channer’s casts of flat fabric into curved resin and aluminum sculptures and she shares with those peers a keen awareness of objects’ material properties and how they tap into our collective cultural and physical associations. Heap not only connects us to the complex world around us but also invites introspection and activates in each of us a fundamental capacity in which interpretation and imagination thrive. All quotes by the artist are from conversations and correspondence with the author during August – October, 2015. 1. Jackie Winsor, quoted in John Gruen, “Jackie Winsor: Eloquence of a ‘Yankee Pioneer’,” ARTnews (March 1979), 57. 2. During the process of making the sculptures for Heap, Fair made a series of photos of several isolated objects, which can be understood individually as “portraits” of the sculptures and collectively as a graphic index of the objects in the installation. 3. Rosalind Krauss, “Sense and Sensibility: Reflections on Post ‘60s Sculpture,” Artforum (November 1973), 43-53. 4. For two excellent overviews of Fair’s work, see Francine Koslow Miller, “The Metamorphosis of Tory Fair,” Sculpture Magazine (October, 2010), 43-47; and Dina Deitsch, Tory Fair: Testing a World View (Again), exhibition brochure (Lincoln, Massachusetts: DeCordova Sculpture Park and Museum, 2011).